These two photos of Enterprise Fitness client, Rhiannon Sheldon were taken exactly 9 months apart. Pictured on the left is Rhiannon at the 2014 INBA All Female Classic, where she took 1st place in her division Figure Intermediate. In the picture on the right, Rhiannon was awarded 2nd place in Figure Open at the 2015 INBA Southern Cross Championships. When Rhiannon stepped off stage in 2014 it was clear to me that she wanted more! So, we set our target on The Arnold Classic 2015. After her win at the INBA All Females I gave Rhiannon 4 weeks of rested training. Although ‘rested’ this period was not at all unproductive. I utilized this time to regain her strength with a 5 x 5 program, it was slow yet was like the ‘reset’ button she needed after her last competition. These four weeks were so important as they primed Rhiannon for her next phase of training where together, we would build her a new set of muscles for The Arnolds! In the 5th week of our post-comp protocol, Rhiannon’s next phase of training commenced. The goal was to put on (a minimum) of 3kg lean muscle mass over the next 6 months. We wanted to bring a bigger, better and fuller package to The Arnold’s, but to do that- it required a hell of a lot of hard work. Rhiannon stuck to the plan and trusted in the process. She completed 6 months of regiment strength training. Her training very rarely went over 8 reps and really focused on big lifts like deadlifts, bench press, chin ups, squats and military press. Rhiannon stayed within these parameters for approximately 6 months. At the 6-month mark she had booked a holiday for 2 weeks. Rhiannon hinted that, “I could train EXTRA if you wanted me to”. So while she was on holiday I thought we would take advantage of all that extra time she had spare. So I wrote her a second program to do in the PM complimentary to her current in the AM. Please note: Rhiannon only trained twice a day for 2 weeks!! At this point, The Arnold Qualifier was in sight and we had put on 4kg of lean muscle while keeping Rhiannon’s body fat below 10%… Goal achieved! At 12 weeks out from The Arnold Qualifier it was time to start leaning down. As her coach, this was easy, as I knew exactly what she reacted to; I removed some of the extra fats from Rhiannon’s diet and slowly increased her carbs, she was in heaven. All was going smoothly and she was leaning out as planned until 2 weeks out from The Qualifier when Rhiannon came down with a gastric virus. She was unable to keep any food in her system, inhibiting her training and causing her to lose muscle mass. This was not what we needed 2 weeks out from competition! After the worst had passed, I took Rhiannon’s BioSignature reading. The results were not good and indicated that the virus potentially threatened everything we had worked so hard for. With a 3kg loss of lean muscle, I had to think quickly. I told Rhiannon to eat a whole gluten free pizza that night and rest for 5 days. I recall sternly telling her “NO TRAINING RHIANNON!” and kept very close contact with her that week. The following week, she came to the studio looking amazing, full and shredded! I took one glance at her and said “F*** ME the plan worked! !” Rhiannon was on top of the world. Standing on stage at The Qualifier she was tall and proud. And so was I. To see what she had been through and how she had come out the other side on top. Rhiannon won her division that day, but the journey wasn’t over! We both agreed that her legs needed to be leaner. To do this, I utilized muscle testing. I told her to lie down on the table at the studio, she had no clue what I was about to do, and went to work devising a specific protocol to reduce her leg fat. The test results indicated that we needed to drastically reduce the amount of supplements in her current protocol and introduce an unusually high dose of L-Carnitine. After 2 weeks, Rhiannon’s legs where half the size that they where at The Qualifier. She looked lean and shredded. BOOM! Victory again. Although she didn’t place, Rhiannon had an awesome experience at The Arnolds. But it was time for one last comp before she hung her heels up for 2015, the INBA Southern Cross Championships. In preparation, I kept her diet consistent with what it had been between for The Arnold Qualifier; very high carb, 4 meals on training days and 7 on non-training. I really honed in on her training, developing programs that often wouldn’t be used at this point in prep, but I knew deep down that they would work for her. 8 x 8 (Vince Gironda) modified NOTE: I turned this into 8 x 10, then made is a giant set consisting of 1-4 exercises in a row. Her PM program that I named “12 Days of Love” which in total had Rhiannon pumping out 510 reps, 6 times a week! (Mwhahah… Evil laugh). What inspired me to make ridiculous programs was how well Rhiannon had reacted to her PM training sessions when she was on holidays. Rhiannon negotiated with me to include cardio. The cardio however was not to lose bodyfat. I allowed her to do one session of fasted cardio for 20-30 minutes, once a week from about 6 weeks out. We included it due to Rhiannon’s request, ‘I miss some ME time’. This time for her was purely to relax and mentally allow her to unwind. That’s it. We did it for mental satisfaction NOT because she needed to do it to get ready. 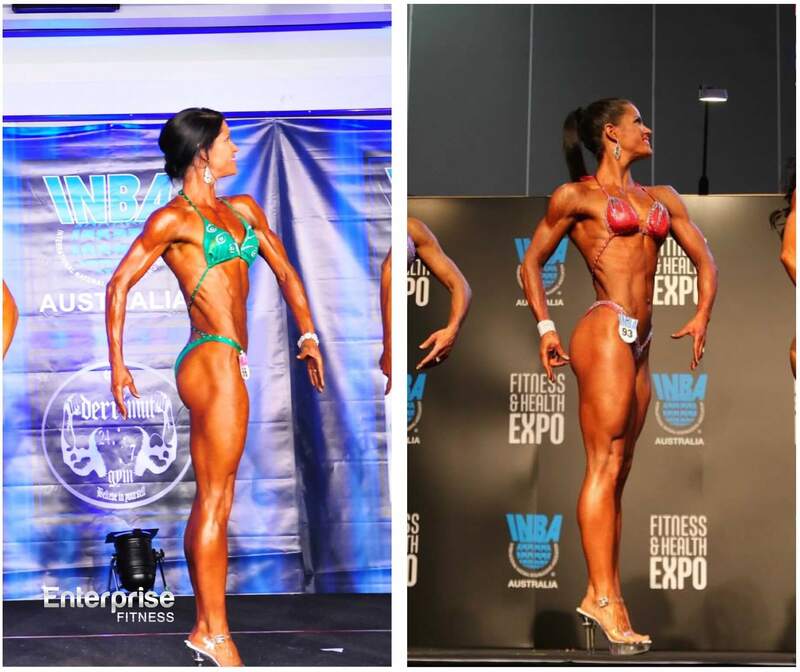 Rhiannon stood on stage at the INBA Southern Cross Championships taller and prouder than ever before, with a fullness and physique that she had only dreamt of (with the help of 2 cups of Glycofuse mixed with electrolytes backstage). I was the proudest I had ever been as a coach. Watching Rhiannon on stage, all I could think about was her journey and how far she had come. All of the hurdles and ups and down, the emotional days that we worked through together and how she had overcome them all, because she is a fighter and she trusted the process and trusted in me. I was so happy for her, words cannot describe. Rhiannon won The Arnold Qualifier and placed 2nd in the overalls at the INBA Southern Cross Championships. An amazing results. In our eyes, Rhiannon will always be a true champion.